Rice and beans are one of my go-to easy dinner recipes, but I guess you wouldn’t know it to look at the collection of recipes on this site. Oh, I’ve got a bunch of rice and bean recipes (check out my jambalaya, Cuban rice and beans, and Brazilian rice and bean bowls), but nothing so quick and unfussy as my typical weeknight rice and beans. Normally, when I’m throwing rice and beans together on a busy night, the entire dish happens in one pot and takes no more than 30 minutes from finish to start. I’ll season the dish up in any number of ways, depending on what kind of mood I’m in and what ingredients I’ve got on hand, but it always pretty much comes together the way this particular recipe does. So, what makes this version Spanish-inspired? The spices! Namely cumin, paprika, oregano, and cilantro. Also, the olives. I’ll take any excuse I can to throw olives into a recipe, and green olives play a big part in Spanish cuisine. One not-so-traditional ingredient I like to use in my Spanish rice and beans (and in pretty much any type of rice and beans, for that matter), is basmati rice. You’d normally find basmati rice in Indian cooking, but I love it with rice and beans for the texture, aroma, and the fact that it cooks up in 15 to 20 minutes. Start by sweating some onion and red bell pepper in a bit of oil on the stove. After a few minutes, add in your garlic and spices. Cook for about another minute, until the mixture becomes very fragrant. Next, add in some vegetable broth, rice, beans and a bit of tomato paste. Stir everything together well and bring the liquid to a boil. Lower the heat, cover the pot, and let it simmer for a bit, until the rice is tender and has absorbed the liquid. Take it off the heat and let the pot sit with the lid on for 5 minutes. Uncover the pot, fluff your rice, and stir in some olives and cilantro. Feel free to substitute your favorite type of beans! Black or pinto beans would be great in this recipe. This dish is very mild, but flavorful. Want some heat? Add cayenne pepper or your favorite hot sauce to taste. Whatever you do, don’t remove the lid while your rice is cooking! You want to contain all the steam in the pot in order for the rice to cook properly. Lots of folks are tempted to peek to see when the rice is done. (I’ve been there!) If this is the case, use a pot with a glass lid. Is this recipe gluten-free? It is! Can I use dried beans with this recipe? Yes, but if you do, you’ll need to pre-cook (and probably soak) them, as 15 to 20 minutes isn’t long enough to cook most beans. Do I have to use basmati rice? Nope! You can use pretty much any variety, I just like basmati best. If you plan on using something different, you’ll need to adjust the cook time and the amount of liquid. Refer to the package instructions for your rice. When cooking your rice, set the heat as low as you can while still keeping the liquid at a simmer. Cooking with too much heat will cause your rice to burn. Too little heat and your rice won’t cook. When the oil is hot, add the onion and bell pepper. Cook, stirring frequently, until the pepper softens a bit and the onion becomes translucent. Stir in the garlic, cumin, paprika, and oregano. Cook for about 1 minute more, until the mixture becomes very fragrant. Add the broth, rice, beans, and tomato paste. Turn up the heat to high and stir to fully dissolve the tomato paste. Bring the liquid to a boil, and then lower the heat so that it’s just at a low simmer. Cover the pot and allow it to simmer for 15 to 20 minutes, until the rice is tender. Remove the pot from the heat and let it sit for 5 minutes with the lid on. Remove the lid and season the rice with salt to taste. Stir in the olives and cilantro. 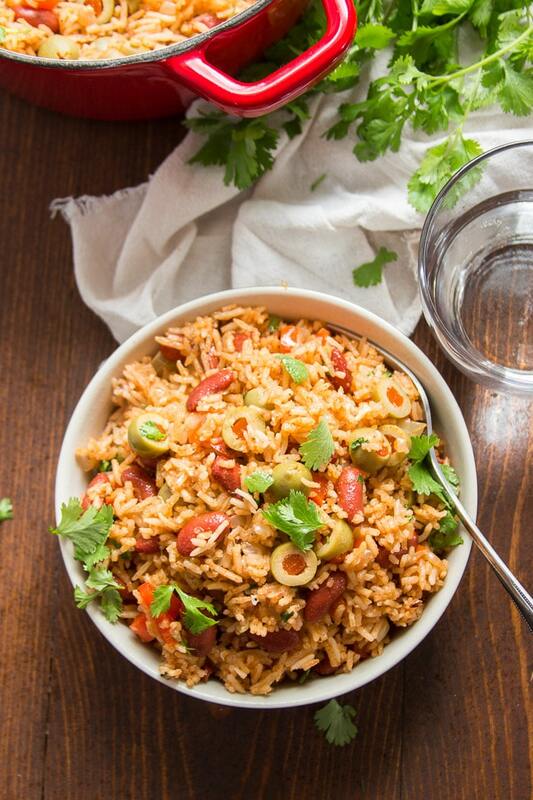 The post One-Pot Spanish Rice & Beans appeared first on Connoisseurus Veg.